The control of land by Britain's supermarkets is set to be highlighted in a key Competition Commission report. Campaign groups have criticised supermarkets including Tesco for owning large areas of undeveloped land across the UK, stifling potential competition. But the supermarkets argue their ownership of so-called "land banks" has not distorted competition. The outline report is also expected to examine whether aggressive pricing is forcing small shops out of business. 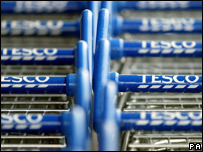 Tesco, Asda, Sainsbury's and Morrisons control almost 75% of the UK grocery market. 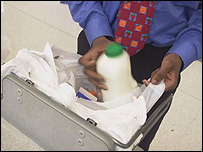 Watchdogs have previously said that the buying power of the big supermarkets could distort competition. Tesco, which accounts for £1 in every £3 spent in the UK on groceries, currently has the largest land development portfolio of the major supermarkets. At least two of the Competition Commission inquiry's six panel members want Tesco to give up some of the land it owns for further development, according to a recent Sunday Times report. But Tesco, the UK's largest supermarket with a market share of more than 30%, has vigorously defended its position and said that it does not believe it has done anything wrong. It said it would be "surprised" if the probe into the UK's supermarkets called for it to sell off some of the undeveloped sites it owns. The Competition Commission's "emerging thinking" document is also expected to examine the relationship between the big supermarkets and suppliers, amid allegations that supermarkets' buying power has increased. Further claims that the retail giants are distorting competition through their pricing behaviour - such as below-cost selling and price flexing - are also being investigated. The Competition Commission's full report is expected to be published next year.